Many consider the motorsailer to involve compromise. Often, the word “compromise” implies that something is less than great. My wife and I have lived on two motorsailers for the last 30 years, and we believe a good motorsailer isn’t necessarily a compromise, but a creation that follows its own unique definition and purpose. As such, it can be an ideal cruising boat. 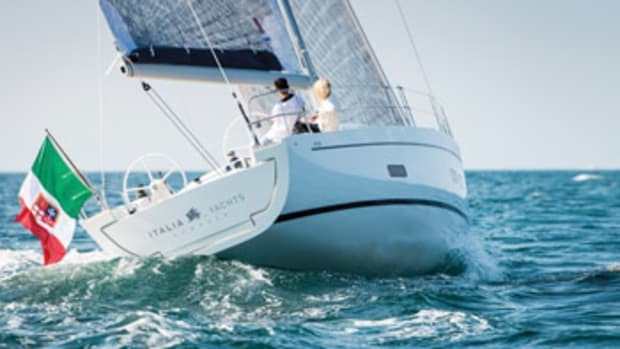 There are a few reasons why I like this type of boat, but first I should acknowledge the continuous debate about the definition of a motorsailer. Some say that any sailboat with a motor is a motorsailer. Others say that a motorsailer is primarily a powerboat with a bit of sail assist. And there are many more opinions. Our concept of a motorsailer will be apparent below, and it’s based on our experience with them as well as many discussions with other motorsailer owners. But there’s room on the seas for many definitions, and I won’t argue with any owner as to what he chooses to call his boat. Also, I’ve seen enough of the ingenuity and skill of modern designers and builders to believe they can always expand and improve upon the concept. When my wife and I got our first motorsailer in 1979, we were strongly motivated by the fact that we didn’t want to give up sailing. Since then, there have been many beautiful times under sail when we’ve been very happy for that decision. But we’ve discovered many other reasons to love our motorsailers, and they relate to what a motorsailer is and the things it will do for you. We’ve found that what we consider to be a true motorsailer typically doesn’t sail as well as a sailboat. Compared to a sailboat, it will probably need to have wind coming from farther aft of the bow. Typically it may be heavier and beamier, with the beam carried farther aft. Its keel may not be as deep because this would hinder performance under power. Thus, it won’t point as well and may have more of a tendency to slide under sail alone. Its rudder may be smaller, for the same reason and because a rudder can be smaller if it’s responding to powerful prop wash. Some motorsailers seem more oriented to sailing than motoring; that was the case with our first one. 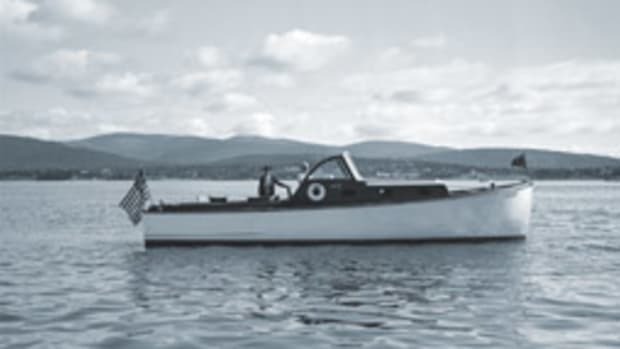 She had a 160-hp engine in a 47-foot sailboat hull, with huge tankage, a barn door rudder and a 5.5-foot draft. Her mast was around 62 feet. But we felt she motored too slowly, considering her engine; she was wet powering into seas because of her sailboat bow; her speed under power was knocked back by even small seas; and she maneuvered poorly in tight quarters. 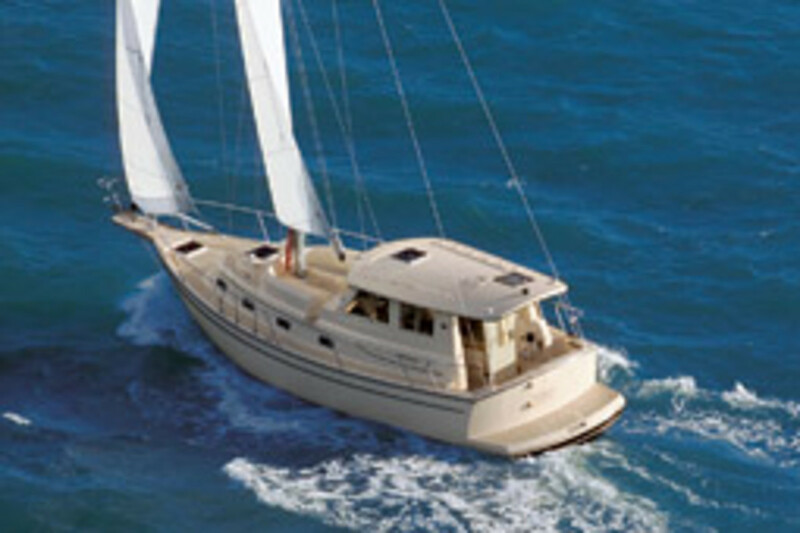 The 53-foot Gulfstar motorsailer we have now only draws 4.5 feet. She has a much smaller rudder, and her stern is almost as wide as her 15-foot beam. 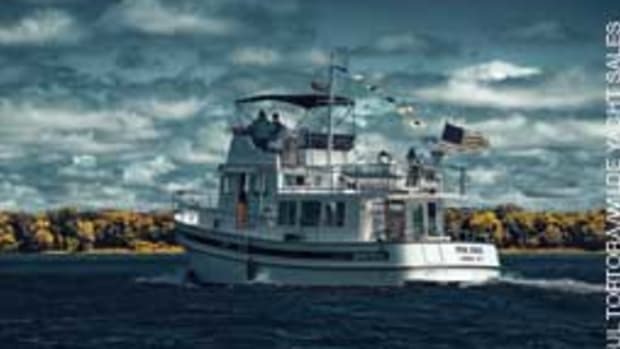 She cruised easily at 7 knots with a 165-hp diesel and now makes 10 knots with a new 200-hp diesel and a more appropriate prop. It takes significant head seas to slow her down. 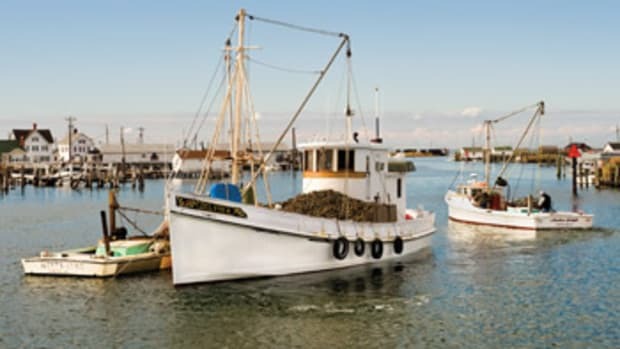 Gulfstar used the same hull for some of its trawlers. We think she’s a much better motorsailer than our first. We need a good breeze abaft the beam to really sail. 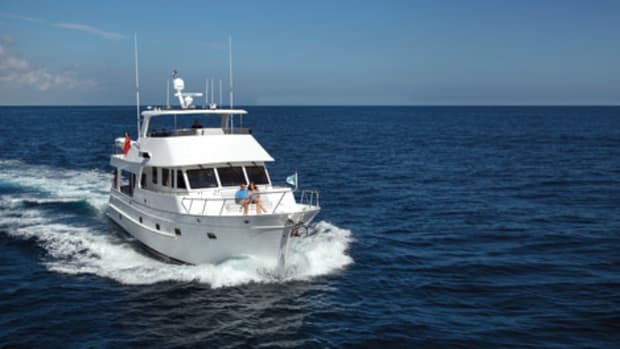 But when we get her out in the ocean with a good breeze abeam or on her quarter and use the engine, she’s nothing short of awesome and majestic. Sail not only helps to power her through the waves, it also stabilizes her. Others may disagree, but in our view this is what a motorsailer should be — not a sailing boat with a big engine and not a powerboat with a stick as an afterthought, but a hull designed to motorsail, with a balance somewhat in favor of motoring well. We’ve noticed that the majority of people with sailboats cruise under power most of the time when they’re taking long trips. There are at least two reasons for this. Many people buy sailboats for day or weekend trips. Sailing on a pure sailboat is a beautiful and workable thing to do under those circumstances. But when they go cruising, they need to reach distant places within their lifetime, so they motor, knowing that when their cruising is over, they can return to the type of sailing they love back home. Another type of sailboat owner perhaps planned to make long offshore cruising passages under sail when he bought the boat. But this dream is often abandoned because of all the difficulties, one of which is vulnerability to the whims of the weather as it affects covering distance and safety. A little engine in a great sailboat isn’t going to do a great job on long passages with no wind or too much wind from the wrong direction. With a motorsailer we may not have the very best of both worlds, but we can be in a much better position to voyage with the method that’s best for the circumstances. There are other benefits to a motorsailer. For example, a powerboat hull usually has more room than a sailboat hull. It can carry more equipment, more stores, more fuel and water — in short, more stuff to make you comfortable. With a motorsailer, you get the bigger hull to carry more stuff, but you keep the ability to sail and have sail assist. A motorsailer is less vulnerable to the vagaries of weather than a sailboat simply because it can travel better in head winds and head seas or no wind at all. This means you’re more likely to reach your destination within some reasonable time frame. And it means you have better ability to seek shelter when a storm is brewing. 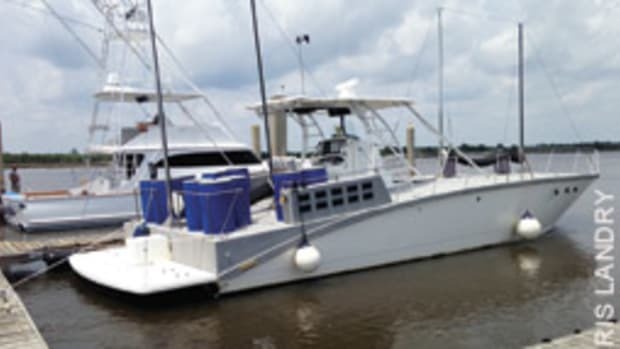 The shallower draft typically found on many motorsailers allows access to more anchorages and makes some inland trips, such as the Intracoastal Waterway, much easier. 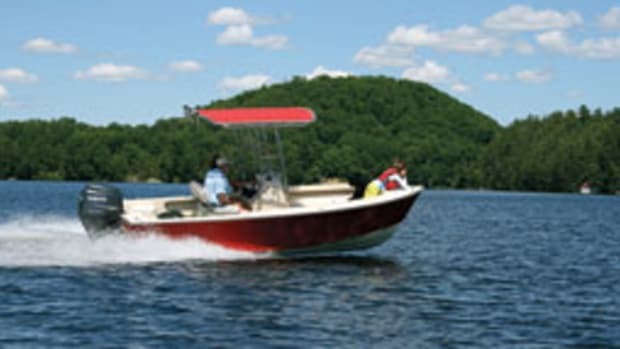 The extra power makes traveling in confined inland waters easier because of the increased speed provided by the engine and because there is seldom the opportunity to sail on the ICW or the rivers of the Great Loop. The type of keel typically found on a motorsailer (reminiscent of the “cruising keels” of older sailboats) provides better running gear protection than the minimal keels found on many powerboats. Also, the hull configuration and sail plan typically results in a more comfortable and stable boat, without using stabilizers. The short mast typically found on the motorsailer makes dealing with many bridges easier than it would be with a sailboat. It also usually means you don’t heel as much in a stiff wind. But some motorsailers, because of hull design and other factors, may reach the point of too much heel (when you can capsize) if there is too much sail up in strong winds, while a comparably sized sailboat would do fine in the same wind. Skippers must be aware of the limitations of their type of hull. A motorsailer often has much better engine access than many sailboats, which have an engine stuffed in between galleys and heads and counters as if it were an afterthought. And a motorsailer typically has more range for long-distance cruising than many powerboats, not only because it can carry a lot of fuel, but also because it can sail some of the time and have a fuel-saving sail assist at other times. As soon as humanity figured out how to drive a boat with engines, that’s what professional seafarers taking long trips began to do. Their vessels evolved from powerful sailing ships with an engine added to, ultimately, no sail at all. Now, some cargo carriers are experimenting with high-tech sail assist again. The motorsailer has a rich heritage, and if you’re interesting in cruising, it could be the right type of boat for you. The article originally appeared in the September 2009 issue.